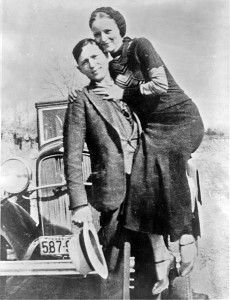 Barrow was a career criminal when he met Bonnie Parker in January 1930. After serving a 20-month prison term, he teamed up with her and embarked on a nearly two-year bank robbery spree in Texas, Oklahoma, New Mexico, and Missouri that commanded sensational national attention. Portrayed as a romantic heroine and hero, who robbed the banks that foreclosed on many hard-working people ruined by the Great Depression, “Bonnie and Clyde” were, in fact, murderers, who killed three police officers. They themselves were gunned down at a roadblock in Gibsland, Louisiana, on May 23, 1934. Their violent deaths together added to their popular legend, and they became the subject of books and a notable 1967 film by director Arthur Penn.